Give your favorite sports enthusiast a gift that shows you truly care with our Sports Care Packages. This deluxe version of our sports care packages for kids is filled with tons of sports inspired toys that will give your favorite kids loads of healthy outdoor entertainment this summer. We didn't miss any healthy outdoor activity with this care package, inside the lucky recipient will find a football with a tail, air missiles, G2 Air flying disc, foam throwing balls, mini basketball game, indoor basketball hoop and ball, G2 rubber playground ball, sling shooter, and a wooden baseball peg game to play before bed. Perfect for the active child, or the child that needs to be more active, these sports inspired games are sure to get them outdoors, and playing hard. Our largest sports themed care package, the Deluxe Sports care package will not disappoint! Sometimes is just nice to send a "Hi, I'm thinking about you" gift, and GourmetGifts.com has the perfect way for you to do just that, with their line of "Care Packages" (really the Ultimate Care Packages!). 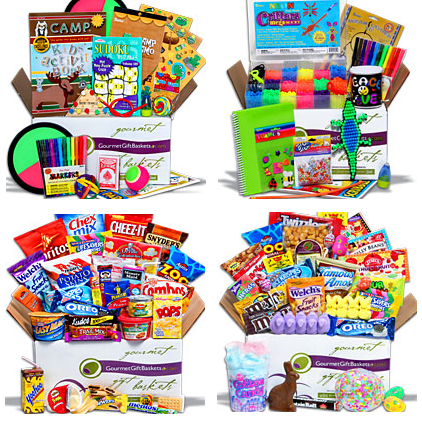 GourmetGiftBaskets.com has thought of everything in compiling their line of themed Care Packages! Whether your celebrating a Holiday, reaching out to a college student, or child about to embark on a long Summer at camp or home......there is a Care Package that will perfectly suit everyone on your list! When the Deluxe Sports Care Package (pictured above) arrived, the kids were giddy with excitement as it immediately set the mood for Spring/Summer! Packed with all of the tools necessary for endless hours of outdoors sporting FUN, I don't think that there is anything that GourmetGiftBaskets.com has missed when compiling this ULTIMATE Care Package! Kick ball, toss and catch games, basketball (great for use indoors while we're waiting for the weather to warm up a little), Frisbee, football........we are completely ready and set for playtime in the Summer Sun! For the perfect way to let that special someone know you are thinking of them, check out the extensive selection of amazing Care Packages at GourmetGiftBaskets.com, I'm confident that you will be just as impressed as I am! Leave a comment~Visit http://www.gourmetgiftbaskets.com/search.aspx?Keyword=care+packages and let me know which care package you would love to send or receive. The Comment is considered your entry. ﻿﻿1)Follow me ( or if you follow ) on Twitter http://twitter.com/savvycouponmom (Additional 5 Entries- 5 comments ). Entry to this giveaway ends at 12pm PST May 20, 2011. Winner's are chosen randomly through random.org. The winner will be announced in a post within 7 days of the giveaway ending, and contacted through email. The winner will have 48 hrs. to respond or another winner will be chosen. I would love to get the "Arts & Crafts Care Package" for my kids! I would love to send the flame enthusiast to my father!